Don't take our word for it, the judges say it all. In last night's America's Got Talent Semifinals episode, the men of In The Stairwell continued their march into America's and the judge's hearts. The group performed a somewhat, patriotic-esque rendition of Ed Sheeran's "Castle On The Hill," which brought both the audience and judges to their feet. 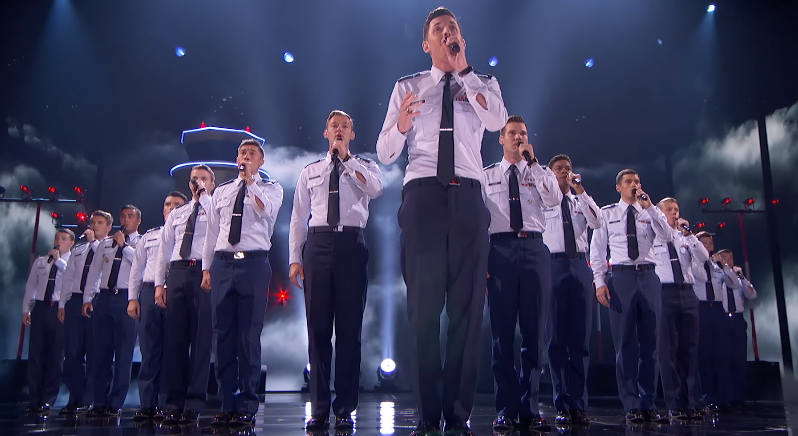 The performance was moving and emotional, showcasing how the all-male a cappella group continues to improve with each appearance. Judge Mel B commented that the group "deserved to be here" and that "[they] just sound incredible" while Simon Cowell remarked "I think we're going to see you in the finals." The group did keep their typical "cheesy" choreography, according to the judges, but it has become a trademark that everyone seems to be enjoying. America finds out tonight whether In The Stairwell advances to the AGT Finale. Here's hoping they do.